Alternative jobs for nurses, often in nonclinical settings, give registered nurses several options to pursue specialized interests. Nurses who do not want to work at hospitals can work at other healthcare facilities, including nursing homes and community medical clinics. Options outside of the hospital allow nurses to interact with the public, serve as educators within their communities, and develop more personal connections with patients and clients. Nurses can also work in administrative and nonmedical contexts. Nurse case managers function as advocates for patients and healthcare facilities, while academic nurse writers and legal nurse consultants provide medical knowledge to individuals outside of the nursing industry. Corporations and businesses also employ nurses to build employee health and wellness, maintain safety, and provide occupational support. Nurses who want to supplement their current position or reinvent themselves as writers, legal consultants, or administrators can parlay their nursing knowledge and skills into a new career. Former nurses, retired nurses, and nurses looking to specialize in a subset of the field can work as self-employed professionals or within business, corporate, and educational settings. Nurse health coaches train chronically ill patients to care for themselves as they cope with illness. They teach individuals about how to adopt a healthy lifestyle and prevent future health crises. Nurse health coaches may specialize in a type of illness or population as they help patients and clients achieve wellness goals. Employed by insurance companies or individual clients, nurse health coaches earn an annual median salary of $45,164. Academic nurse writers publish nursing-related content in medical textbooks, training manuals, and patient handbooks. They also contribute to healthcare websites, work for insurance companies and regulatory bodies, and create marketing materials. Nurse writers need a strong grasp of grammar, language, and reference styles to provide specialized nursing information in clear and concise prose. Academic nurse writers can work as freelancers or staff writers, earning an annual median salary of $70,522. As one of the most lucrative nonclinical jobs for nurses, legal nurse consultants enjoy an annual median income of just under $75,000 and provide valuable links among medical, policy, and legal communities. Tasked with providing medical information during legal trials and proceedings, legal nurse consultants help legal professionals understand and navigate medical terminology, procedures, and practices. Legal nurse consultants may also provide services to insurance companies, long-term care facilities, and law enforcement agencies as staff employees or private entities. Hospice nurses work with terminally ill patients and their families. They tend to patient needs, managing pain and monitoring vital signs. They may help with household tasks or run errands for patients as well. Hospice nurses also provide emotional support to patients and family members, explaining the final stages of life. They may help patients and those close to them cope with and accept the inevitability of death. Hospice nurses earn an annual median wage just over $63,000. Public health nurses implement health programs, promote wellness, and educate communities about medical conditions and treatments. They work with children, adolescents, adults, and the elderly, providing information about health at all stages of life. Public health nurses may work in schools, nonprofits, government agencies, or medical facilities, advocating for public health policies as they relate to the needs of individuals and groups. With a variety of employment opportunities, public health nurses earn median salaries of around $57,000 annually. A popular alternative job for nurses, occupational nurses receive a median salary close to $70,000 and provide medical insight and guidance in a business setting. Occupational nurses work with managers and executives to develop safe workspaces and policies. They may offer seminars and trainings to employees on physical exercise, nutrition, and hygiene; assist workers with mental health issues; and treat and document workplace injuries and illnesses. Occupational nurses can provide similar functions at hospitals and other treatment facilities. Nursing case managers manage patient care from admission through discharge. They make medical decisions about long-term patients, including decisions related to finances, family, and resources. Nursing case managers act as intermediaries between doctors and patients, representing the interests of healthcare facilities and patients. They may collect data on patient care for written and oral reports. Skilled communicators, incredibly organized, and resourceful, nurse case managers earn annual median salaries of $70,271. Registered nurses specializing in dialysis work with patients suffering from kidney diseases and illnesses, earning median salaries of just over $66,000 annually. Dialysis nurses administer dialysis to patients at dialysis centers, hospitals, nursing homes, and other healthcare facilities, or as in-home healthcare providers. They give medication and monitor the dialysis process. Dialysis nurses also educate patients and their families about controlling and mitigating the effects of kidney disease. As registered nurses with additional training in gynecological and obstetrical medicine, nurse midwives assist pregnant women before, during, and after childbirth. Certified nurse midwives educate on matters related to reproductive health, infant development, and women’s issues, like puberty and menopause. Nursing midwives may work independently or in physicians’ offices, providing information and support related to prenatal nutrition and health, labor and delivery, breastfeeding, and postpartum care. Nursing midwives earn annual median salaries of almost $93,000. Nurse educators train future nurses as instructors at colleges, universities, and nursing schools. 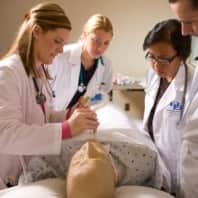 They use their clinical knowledge and experience to design, implement, and adapt nursing curricula; advise students as they pursue a nursing degree; and mentor nurses as they enter the workforce. Nurse educators may specialize in a subset of nursing or advance to an administrative position within nursing education. Nurse educators earn annual median salaries of $73,710.